Cartagena is one of the best destinations in South America because of its historical, Caribbean vibe, and because it offers a friendly and easy introduction to the continent. Travelers from around the world have been charmed by Cartagena, whether it was for several days, a few weeks, or some that have stayed even longer. 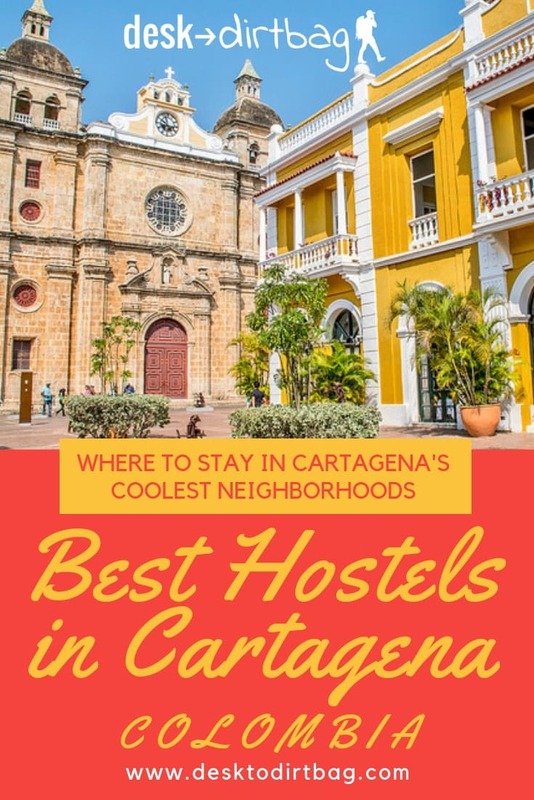 Here is a compilation of the best Cartagena hostels that will give you the best value for your money (so you can have more pesos in your pocket whether that’s to stay longer or just do more activities in this vibrant city). It’s important to remember that just because a place is expensive, doesn’t mean that it’s the best and likewise not all cheap hostels are bad. Honestly, when I’m searching for a place to stay, I am looking first for the hostel’s basics (and so should you) such as cleanliness, great service, free breakfast or at least a shared kitchen, and then everything else is icing on the cake. 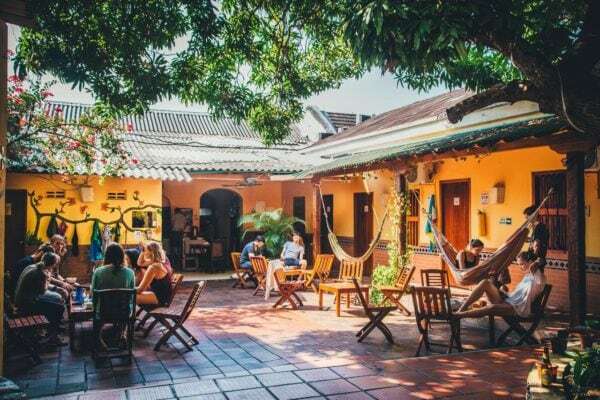 In this article, I will share the top places to stay in Cartagena along with a few points about what makes these hostels stand out from the hundreds of accommodations in Cartagena. When you are searching, be sure to read the opinions because these reviews show legit, independent feedback on the hostel’s service and amenities. Look for mentions of how friendly and helpful the staff is, of how comfortable the beds are, and little extras that are not offered in other accommodations. You want your stay to be stress-free and smooth sailing so you can maximize your time here, whether that’s enjoying the best Cartagena tours or just chilling in the white sand beaches (after all, you are in the Caribbean!). So sleeping arrangements should be comfortable and offer some sense of privacy even in dormitory rooms. Individual bunks should also be equipped with a light, charging space for your devices, a good-sized locker (don’t forget to bring your padlock), and enough space for your backpack. We want you to have a good time, in a good place, without having to spend a bunch. 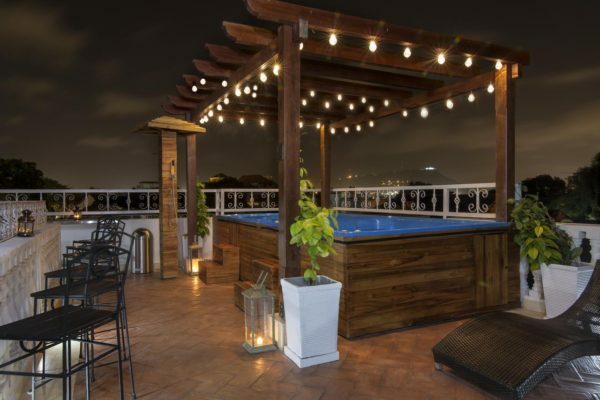 So if Cartagena is in your travel plans, pin this list of the best Cartagena hostels that will give you more value for your dollar. 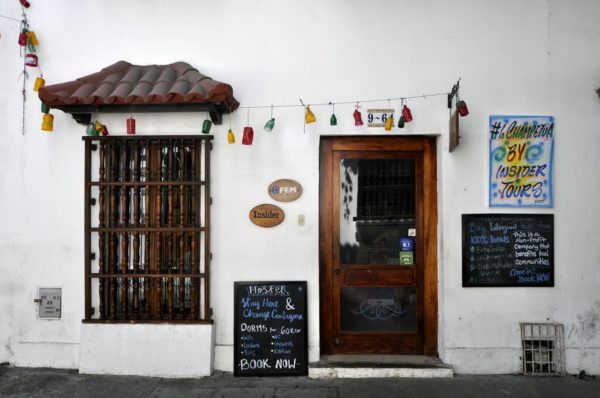 Bourbon St. Hostal Boutique is one of the best Cartagena hostels which is right in the heart of Cartagena’s old walled city. 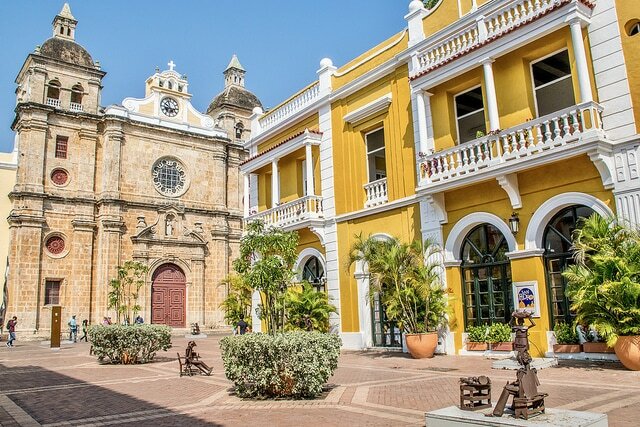 It is strategically located in Santo Domingo Square which is also near the city’s most important tourist attractions like the Modern Art Museum, Bolivar Park, and Cartagena’s Gold Museum. Previously a colonial house of Señores Condes de La Santa Cruz, it was redesigned to house a hostel, restaurant, BBQ area, pool and bar. The old Colombian and Hispanic interiors are amazing for a hostel and it will surely inspire you to be posting on Instagram. 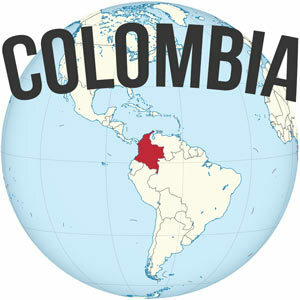 With its live bands and entertainment (maybe the Bourbon Street name gave you a clue), it has become one of the most recognized bars in Colombia. Bourbon St. Hostal Boutique is where the action is. Nightlife around the hostel is just as lively with many of Cartagena’s nightclubs and bars around. Get ready for some salsa and Latin dancing! 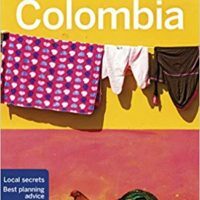 This top reviewed hostel in Cartagena on Booking.com has 1,730 opinions (and counting), giving it a Superb rating overall. Great for solo travelers, this place has earned top ranks in service, cleanliness, and location. Starting at $21/night you also get free breakfast with good-tasting Colombian coffee. A cool and friendly vibe with helpful staff adds more to the great value that this hostel already offers. 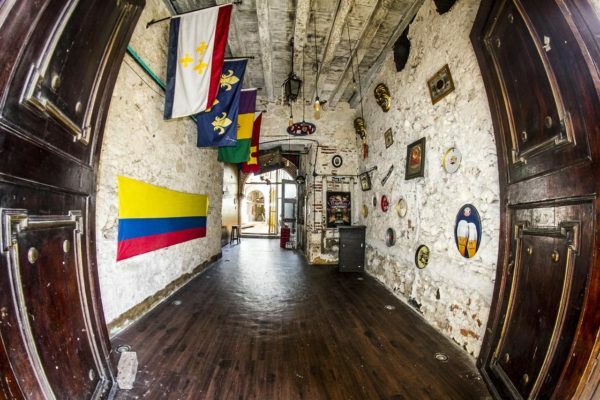 Check the latest prices of Bourbon St Hostal Boutique now. If you are looking for a hostel that offers peace and quiet then The Clock Hostel & Suites is perfect. Great for digital nomads who also want to squeeze in some work time while having some fun around the city of Cartagena. Free and reliable WiFi works anywhere in the hostel whether you prefer working in the bar, near the pool, or in the co-working space on-site. The Clock Hostel & Suites is named as such because of its proximity to El Reloj or the Clock Tower. Highly recommended for its great location in the Centro, it is a few blocks away from Cartagena’s Gold Museum, Bolivar Park, and walking distance from the artsy neighborhood of Getsemani. Museums, cafes, restaurants, and even a grocery store are easily accessible to the hostel. Room rates start at $17/night with free breakfast. The cubicles are designed like a small private room with curtains to provide privacy and safety for your belongings. 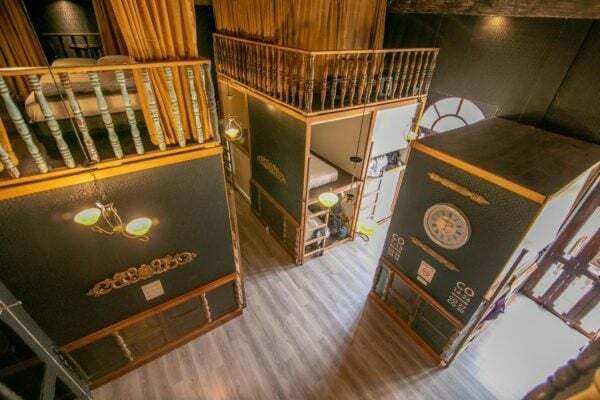 They offer single or double beds in dormitory rooms, single and double private rooms, and a penthouse (interesting for a hostel to offer penthouse accommodations!). Great for solo travelers and also couples who like a quieter part of El Centro. 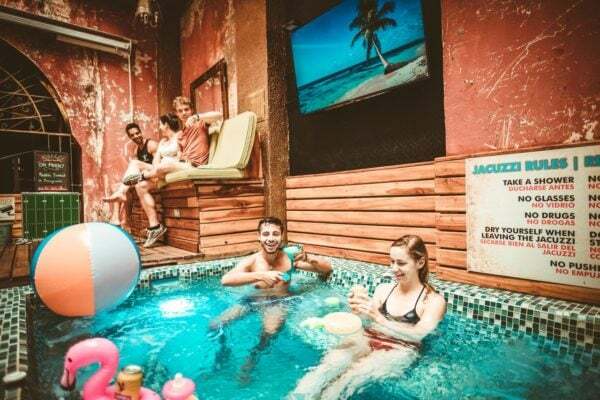 A jacuzzi is set out in the patio and pub where you can enjoy having drinks with other hostel guests. If you want to warm your take-out or cook your own meal, check out their super kitchen. The Clock Hostel certainly delivers great service around the clock! Check the lowest rates at The Clock Hostel & Suites now. Life is Good Cartagena is the top hostel in Getsemani, a vibrant neighborhood which is a 10-minute stroll away from the walled city. Walking around Getsemani is a visual treat, from the colorful houses adorned with bright bougainvillea flowers to the excellent street art and graffiti to the lively Plaza Trinidad. How about watching the sunset from a jacuzzi on the rooftop? Whether you are traveling solo or as a couple, Life is Good Hostel offers this great view and a great stay in an interesting neighborhood (Getsemani is my neighborhood of choice in Cartagena). For budget travelers, you can book rooms as low as $18/night with free breakfast. The hostel offers private single or double rooms, mixed dorm rooms, and family suites. They offer coffee, tea and drinking water throughout the day (those are big savings on your daily travel budget). For vegans or those with food preferences, you have dairy-free and vegan options here. Walking around Getsemani you will also find budget-friendly spots for eating a real Cartagenero meal or getting the best coffee in Colombia. Just wander off in Getsemani to revel at the street art which displays some passionate expressions about social justice issues and other happenings in Colombia. 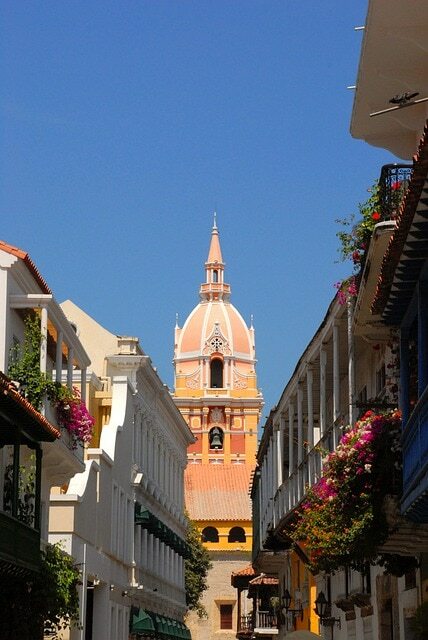 This is just one of the most authentic neighborhoods in Cartagena. Hey, LIFE IS GOOD in Getsemani. Book your stay at Life is Good Cartagena Hostel now. Another top Getsemani hostel with very budget-friendly prices is One Day Hostel, about 10 minutes walking from Cartagena’s waterfront. It is a few blocks from Cartagena’s tourist attractions like the San Sebastian de Pastelillo Fort, San Felipe De Barajas Castle, the Palace of the Inquisition, the Cartagena Gold Museum and the walled city. One Day Hostel offers mixed dorm rooms and private rooms. Instead of the usual bunk beds, their shared dormitory for 4 or 6 individuals has single or double beds. Starting from $13/night, it also includes free breakfast. Overflowing coffee and tea are available throughout the day. Another tip while you travel, try to bring your travel mug and/or bottle so you can fill it up with water or beverages in the hostel (how’s that for saving$$$… ka-ching! ka-ching! ), because you shouldn’t drink the tap water here on the coast. After an exhausting walking tour or a day trip to the beach, kick back and relax in their rooftop terrace with jacuzzi. Bring out some drinks and BBQ. 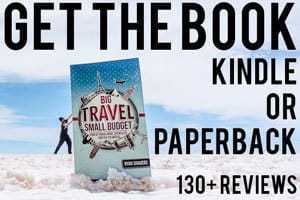 Get the chance to know fellow travelers and maybe you can find an instant friend. 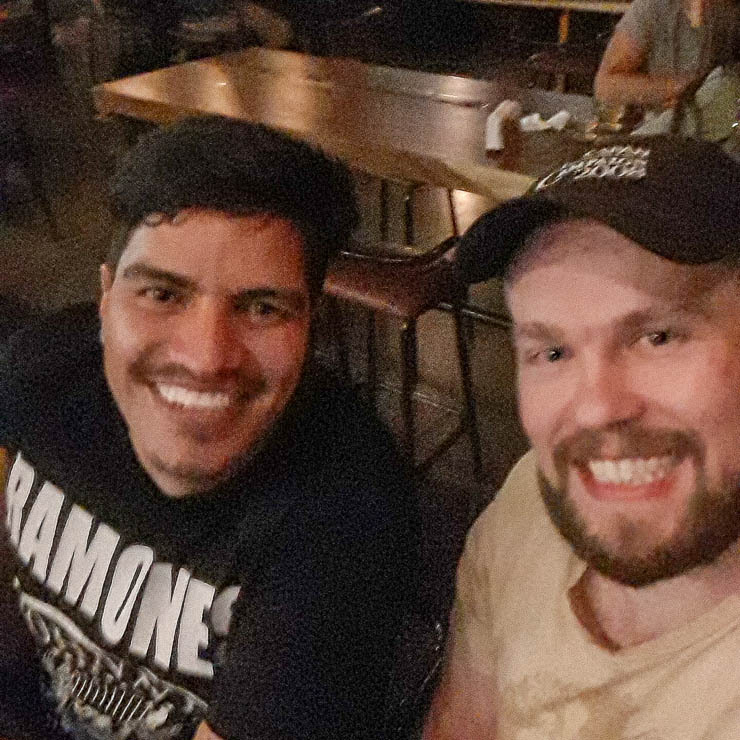 One Day Hostel will be a fun and comfortable place in Getsemani where you can stay for a day or maybe… for one more day. Check the latest prices in One Day Hostel now. A 5-minute walk from Plaza San Diego is Maloka Boutique Hostel. It is also centrally located just minutes away from Cartagena’s walls, The Clock Tower, Cartagena’s Gold Museum, and Bolivar Park. 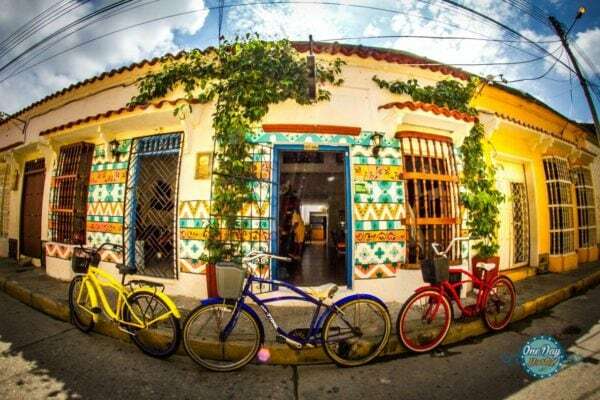 If you like going around on a bike, the hostel also offers bike rentals, which gives you more chance to see other interesting places like the house of the famous Colombian novelist Gabriel Garcia Marquez. You can even go to Bocagrande Beach which is about 15 minutes away. Room rates start at $15/night with free continental breakfast, there is also a cafe on the ground floor attached to the hostel. An upstairs terrace is a wonderful spot to watch Cartagena’s amazing sunsets. The bar here offers an exceptional selection of locally brewed craft beers (shoutout to Cartagena’s local businesses!). 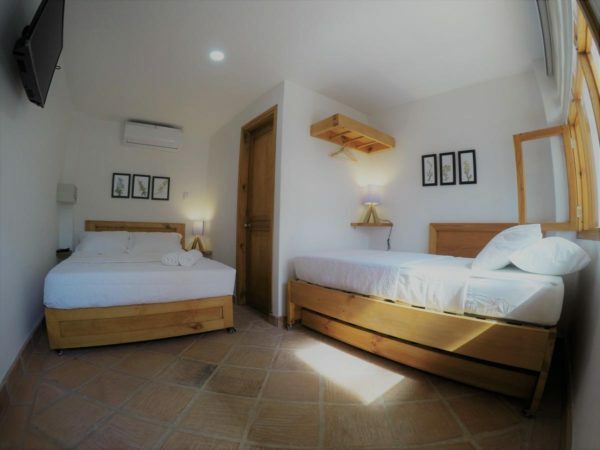 Maloka Hostel Cartagena offers private rooms, mixed dorm rooms, and private rooms with a shared bathroom. The bathroom showers have hot/cold water which is not usually common in hostels in the area. Designed in a trendy hotel style, this place is best for traveling couples who like a relaxed and quieter neighborhood. 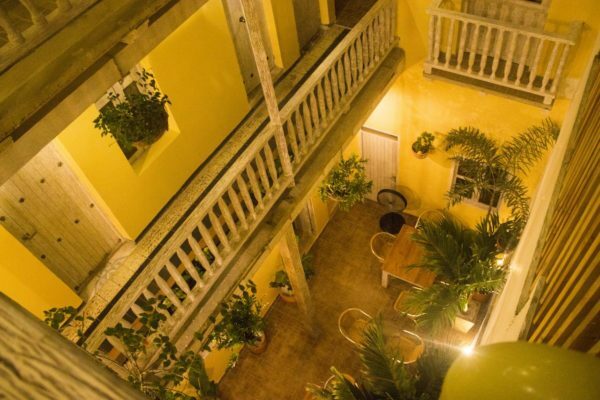 Maloka Boutique Hostel is located about two blocks away from the noisier part of Cartagena. Book your stay at Maloka Boutique Hostel now. The San Diego district is still inside Cartagena’s walls but it has a more relaxed atmosphere amidst restaurants, bars, and cafes. República Hostel Cartagena is 400 meters away from Cartagena’s Gold Museum and the Bolivar Park. 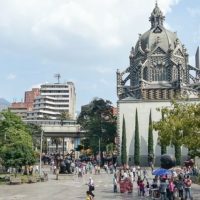 In Plaza San Diego, you can sit and relax in one of the benches or the cafes to have a cold drink and watch as people go by. Private Rooms and mixed dormitory rooms start at $14/night with free breakfast. The free breakfast is cooked to order. The hostel has a terrace with lounge chairs and an outdoor swimming pool (most Cartagena hostels offer jacuzzi or hot tubs only). These two additions are very essential for extremely hot days. It also has an on-site bar. 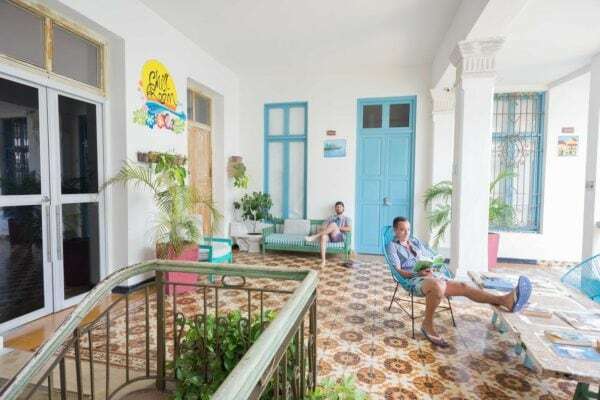 República Hostel Cartagena is an old colonial building and the common area, called the Chill Room, also is styled in a cozy, laid-back manner. Some of the rooms have a balcony overlooking the busy shopping street below. 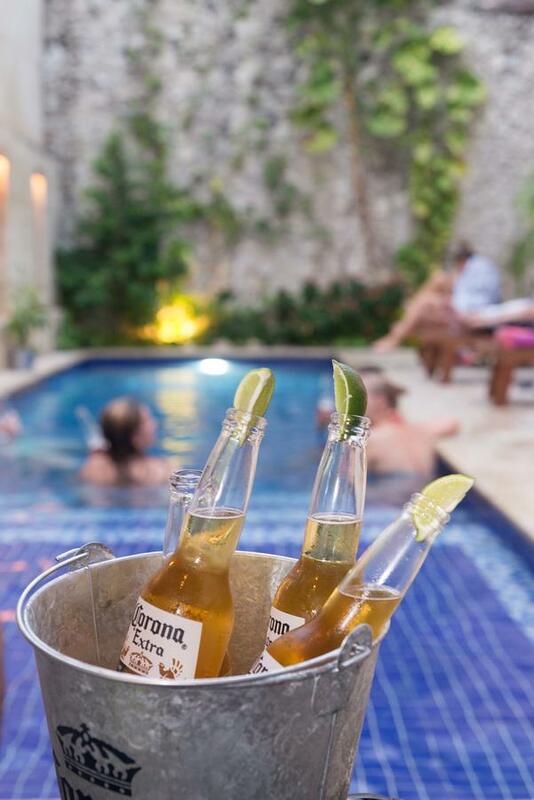 The staff can organize pub crawls, island tours, and other Cartagena activities for you. This extra service can be very helpful for those who do not speak Spanish or those who need a local’s recommendation for things to do and places to go. The location of República Hostel Cartagena is spot-on plus the clean design and excellent service of the staff is important. 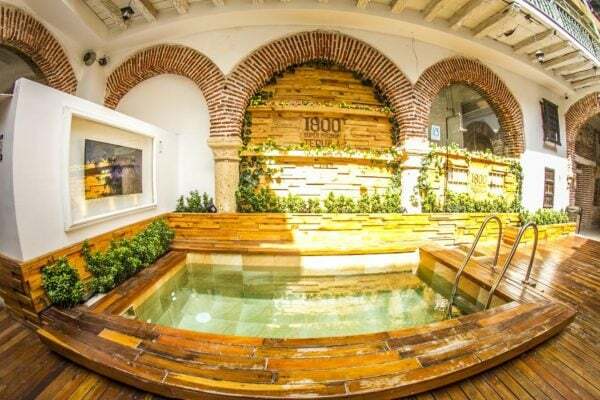 This hostel will make you feel at home in Cartagena. Check the latest prices at República Hostel Cartagena now. Just a block from popular Fernandez de la Madrid square in San Diego district is the Viajero Cartagena Hostel. Visit the house of the Colombian writer and journalist Gabriel Garcia Marquez which is just 150 meters away. You can also go to the Clock Tower and the Iglesia de Santo Toribio de Mogrovejo, both 5 minutes away from the hostel. Viajero Cartagena Hostel offers private rooms and mixed dorm rooms that start at $13/night with free breakfast (look for the delicious regional jams served during the buffet breakfast). Warm hues and dark wood furnishings with highlights of bright artworks are all over. The colonial-style courtyard is a crowd favorite with its quirky decor, plants, and tiled floors. 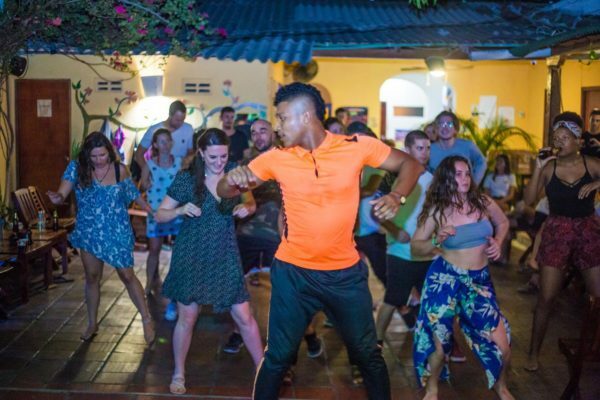 Learn how to dance Latin-style with a local instructor in this same courtyard or enjoy one of the hostel’s entertainment nights. There are social activities scheduled by the staff (grab the chance to connect to fellow travelers). Bicycle rentals and city tours can be arranged by the staff. Free maps are also available from the tour desk (ask them how to get the most delicious street food or anything they can recommend). They also offer currency exchange in this hostel, more convenient if you need to exchange some of your money to pesos. Enjoy the grill and the drinks from the bar. Or maybe plan that day trip for tomorrow. El Viajero Cartagena really knows what you need as a traveler. Book your Cartagena stay in Viajero Cartagena Hostel now. Playa Blanca is Cartagena’s most popular beach destination which is about 45 minutes from the city to Baru by boat. 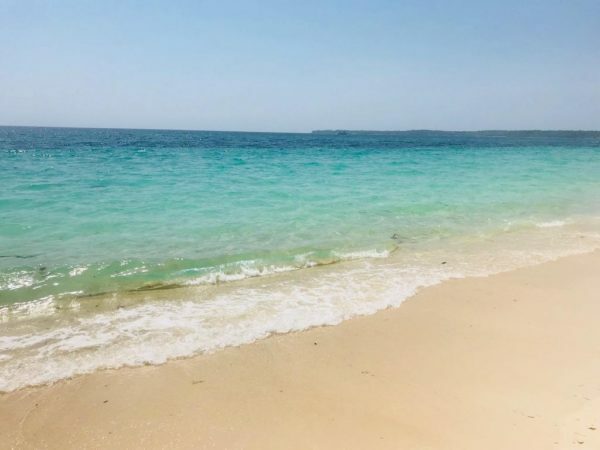 You can’t go wrong with Hostel Ichtus if you want to make your visit to Baru an overnight trip because of the white sand and crystal clear blue waters of Playa Blanca (one of the top things to do in Cartagena, for sure). There are single and double private rooms which start from $28/night. If you are lucky, the room with a view of the ocean might be available for you and you can just sleep watching the waves lapping on the shore. Hotel Ichtus also offers a sun terrace so you can soak up the sun and the salty breeze all day. A restaurant is also ready to serve you Caribbean cuisine. The accommodating staff can set up whatever experience you like on your beach vacation like fishing or snorkeling. A most interesting tour that they can arrange for you is watching the luminescent plankton at night. But of course, the beach is in front of you and you can claim a hammock and order cool tropical drinks. As I said, not all cheap accommodations are bad. Hotel Ichtus offers a white sand beach plus a lot more surprises for a very low price. Book your Cartagena island vacation in Hostel Ichtus now. 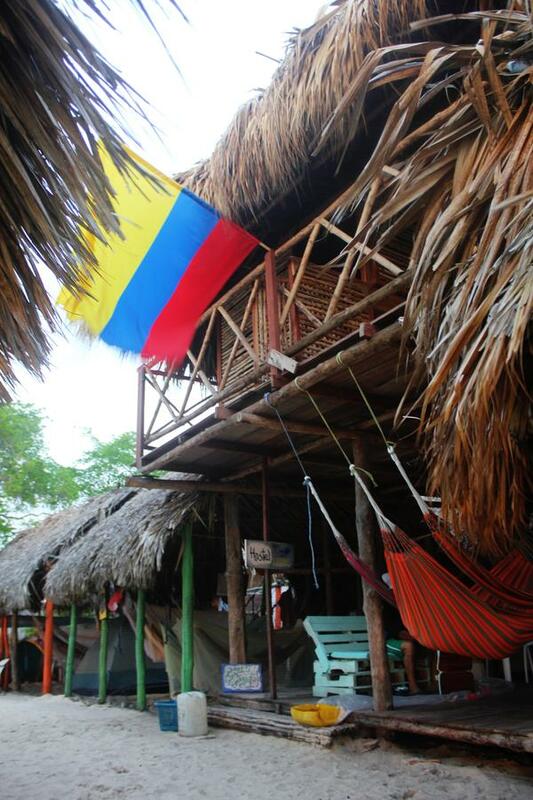 Bombastic Hostel is a newly opened hostel in Isla Tierra Bomba, an island about 10 minutes away from Cartagena by boat. The island is close enough that you can see the skyline of the city. If you watched Anthony Bourdain’s No Reservations episode in Colombia then you’ll remember that he called Tierra Bomba “a whole other world.” This place is perfect for those looking to get off the beaten path and have a totally different sort of Cartagena experience. Get a single or double private room in white sandy beaches of Isla Tierra Bomba for only $22/night. Each room has air conditioning and most units have their own balcony. The hostel offers free shuttle service (this is better than getting expensive boat tickets to get across the bay). Bombastic Hostel also provides guests with an outdoor pool and a fitness center. The restaurant is also available to serve you. The restaurants on this island may be a little expensive so the hostel restaurant can also offer a good price for a meal. Check the cheapest prices in Bombastic Hostel now. Aside from it being in a very good location inside Cartagena’s old walls, Volunteer Hostel Cartagena is also spot-on with its ethos. 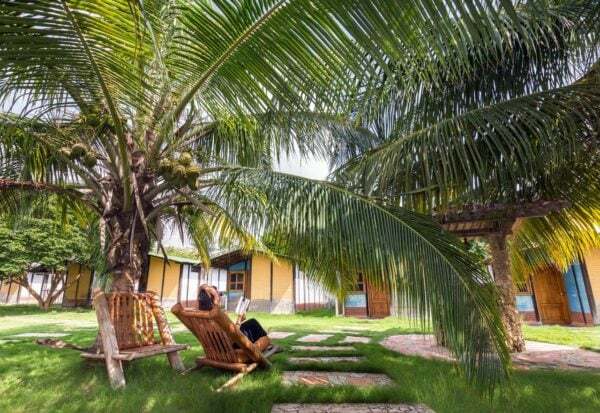 This hostel strongly believes in sustainable tourism conducted in a business environment of equality and free from any discrimination. By supporting this unique social enterprise, you also help the local nonprofit called FEM (Fundación por la Educación Multidimensional) to be self-sustainable. Volunteer Hostel Cartagena offer one of the cheapest rooms starting at $8/night with free breakfast. The hostel has single or double beds in dorm rooms and private rooms. All of these rooms have shared bathrooms and shower. Wastewater from the hand basin is collected to use for flushing the toilets, which is a pretty remarkable step by the hostel to be eco-friendly and care for the environment. You can bring purpose to your vacation by being a volunteer and help the local community. Travel is not only a gift to yourself but also a gift to others. With your help, you get to support them in their cause that tourism is a chance to enhance pride and self-value for their fellow Colombianos. 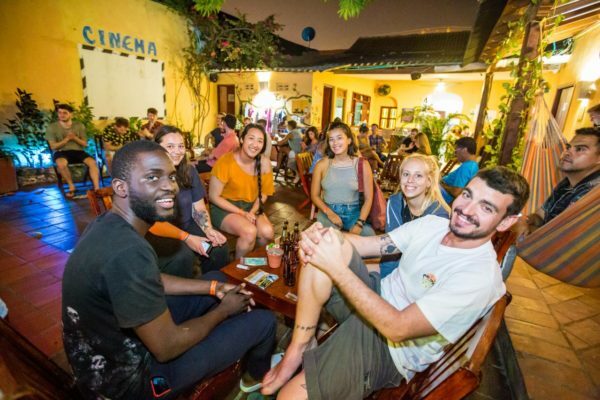 Being a responsible tourist goes a long way when you book with Volunteer Hostel Cartagena. Yes, you can also do your part while enjoying a vacation. Book your Cartagena stay in Volunteer Hostel Cartagena by FEM now. The sights are amazing, the food is great, and entertainment is never in short supply in Cartagena (or anywhere in Colombia for that matter). Any of the nightlife spots is worth a try, and dancing and music is everywhere all the time and almost everywhere — in the plaza, at the market, or on the streets. Cartagena is where the rest of Colombia goes for a vacation and a good time. All of this translates to the warm gregarious nature of the locals who enchant every visitor to stay a little bit longer than planned (I know, just like me!). If you decide to stay longer and are looking for a week-long or month-long vacation, then I would recommend booking from Airbnb. Most hosts offer big discounts for longer stays. It’s my preferred way to stay for longer trips. 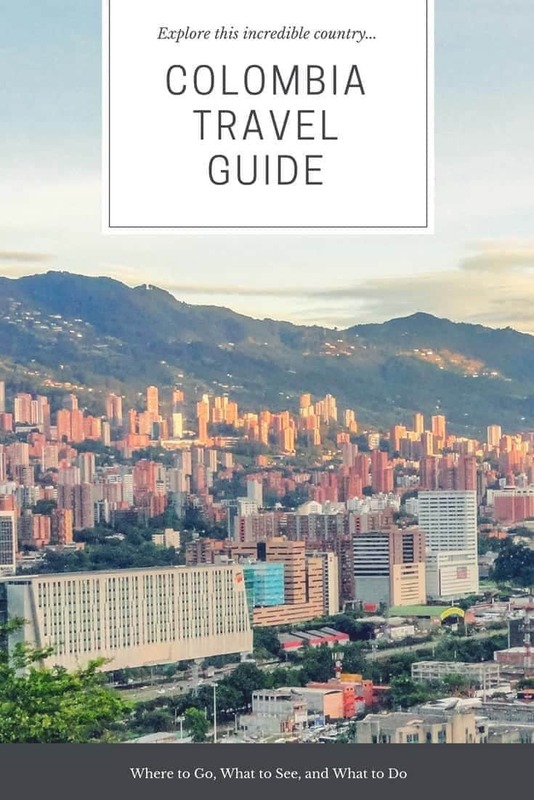 You can also check out my comprehensive guide of things to do in Cartagena so you will know a little more about the coolest places to explore during your stay in this awesome city. Don’t forget to think about your safety and security. 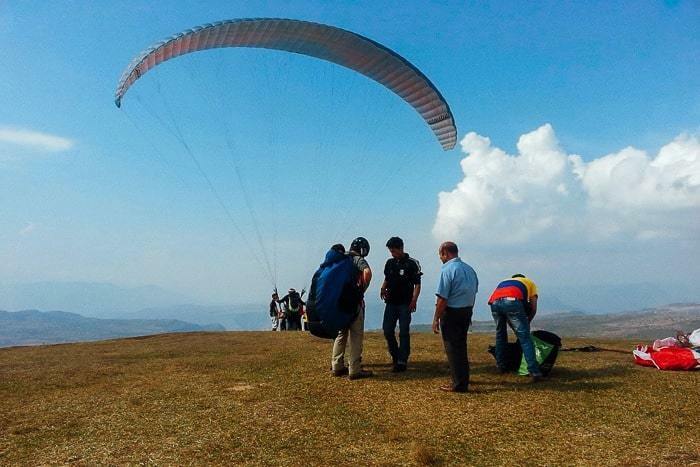 Travel insurance is like a parachute you can pull if you need it. 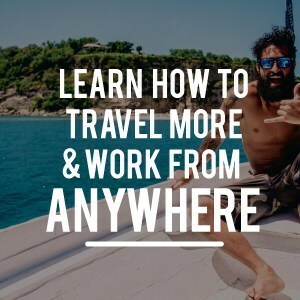 Get your travel insurance, just like I did, with World Nomads. 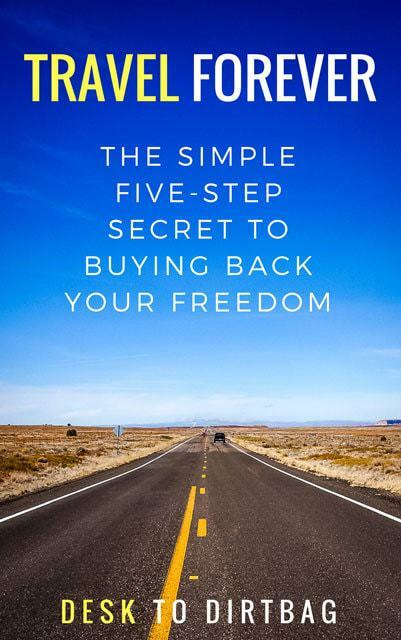 It will give you a backup plan in case your trip turns the exact opposite of what you originally planned. 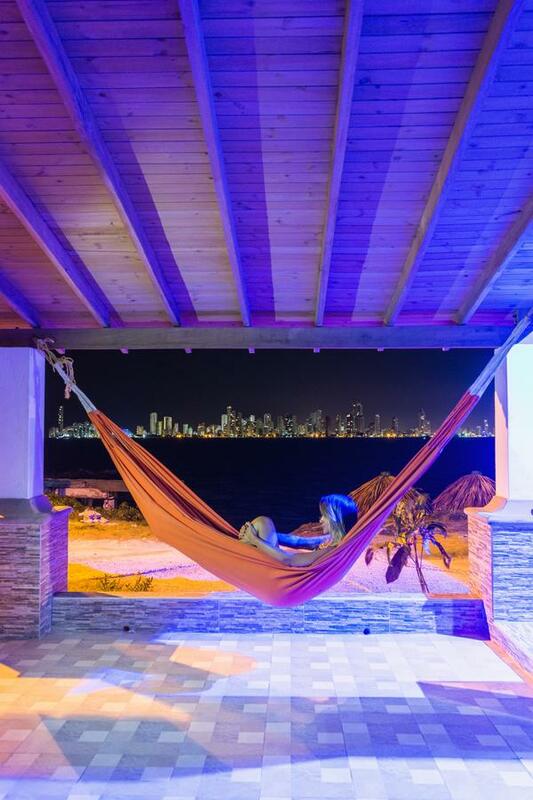 Did you enjoy this post about the best Cartagena hostels? Take a moment to share it on Pinterest, Facebook, or Twitter. Thanks!